Pipefish are related to the seahorse and the harlequin ghost pipefish is probably the most beautiful of the family. Other family members include the robust ghostpipefish, banded pipefish and flag-tailed pipe fish. This strange looking little creature can grow up to 15cm but hard to find as most of them are no bigger than your little finger. They are normally found living around crinoids, featherstars, gorgonian fans and branching black coral bushes. Here they live very well camouflaged by their complex colour patterns and body shape. Key to this effect is the fish's skin flaps, which mimic the 'feathers' of the host crinoid. They have very small territories which they tend to stay in as they are weak swimmers, propelling themselves by rapidly fanning their fins. While this technique allows for very precise control of body position, the range of individuals in this species is limited. Anyone who really wants to find them will have to be very patient and fond of looking at featherstars for long periods or choose a dive centre with skilled divemasters who know where they are. Yes, I'm a newbie, but I read the rules, and tried really hard looking through as many tags as I could to see if the jagaurundi has been featured. If it has please forgive me, and I will remove this post if it annoys too many people. 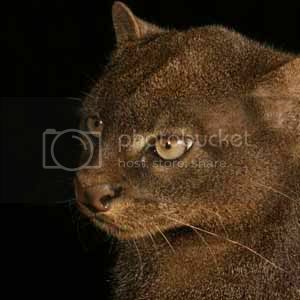 Are US 'Black Panthers' Actually Jaguarundi? Again, sorry if I stepped on any toes, I just really loves these cats and would like for more people to know about them <3 Please let me know how to fix anything for future posts. This I found in my garden the other day and it was running it's antenae through it mouth continuously. KELLY MUNDAY was quick with her camera while visiting Lakelse Lake with her family in April. The result was some stunning photos of an eagle attacking a swan. “We went to the mouth of the Lakelse River and spotted a pair of swans. I took some photos of them flying overhead. An eagle came out of nowhere and grabbed one swan and tried to take it down,” she writes. And people wonder why America chooses the eagle as our national bird? ETA: How about some sauce? I know you already have one of these but I thought maybe I could add to the collection. I found it in my kitchen. Its a wind scorpion. Ive read that they're not venomous but those jaws still creep me out. Its an arachnid but its not technically a spider or a scorpion. Its a Solfigae (Solpugid). Alright, I'm new. I joined because of the spotlight, but that doesn't automatically make me an idiot. I checked the tages and there's nothing about these guys anywhere. In fact there are hardly any horse entries at all, which is surprising. Anyway, I hope you enjoy this post (cut pretty much verbatim from my own journal from September last year). Yes, there's more than one breed of horse mentioned, but they're all connected, as you'll see from the post. The discussion I read a few posts back seemed divided as to whether or not the poster or the mods tagged the post, so I haven't - if I should, I will. Anyway...A breed of horse I only found out about fairly recently: The Moyle. And what's so interesting about Moyle horses, you ask? A GIANT beetle with an inch-long horn is looking for love after sneaking into Britain - in a shipment of bananas. The elephant beetle - more at home in the rainforests of Costa Rica - is now fully grown at nearly five inches long. And time is ticking because elephant beetles - an endangered species - live for just four months. The creature arrived in a container shipment of bananas from Costa Rica to London and was handed to Linton Zoo, Cambs, by pest control officers last week. They nicknamed him Billy and are busy satisfying his voracious appetite - he munches mangoes and bananas. Zoo staff cannot tell his precise age but believe him to be full grown because he has a 4cm-long horn and weighs 35g. Linton Zoo director Kim Simmons said: "Billy needs to mate. "He is showing all the signs and keeps displaying. He bobs up and down on his branch and taps on the ground. "He has been making the most of his new home and emits tiny mating calls. It's like he's saying 'here I am, come get me'." An attempt at a passable WTF_nature post - hopefully educational, witty, with a nice picture. Nightmare inducing & more killer rep for Australia a bonus. Disappointingly, my lack of a camera at the time, and the understandable reluctance of a large carnivore to hang around with the kind of person who says "hey, large carnivore in my van with me, where's the camera? ", I missed out on getting lots of lovely photos of a very VERY large and very pretty Blepharotes coriarius. "'What is a Blepharotes coriarius?' I hear you ask." Imagine a fly, the size of the palm of your hand. Make it hairy, and a vivid black, white, and orange colour scheme. Give it googly eyes as big as the rest of it's head, a charming white handlebar moustache and a beak as thick as a pencil lead with which she stabs her prey in the chest and injects nerve poisons & digestive enzymes.